When programs attend USASF Sanctioned Events, they can be assured that their athletes, coaches and parents are attending events that comply with the sport's best safety practices. Event producers must provide minimum safety standards before their events qualify as USASF Sanctioned. Coaches, as you plan your competition calendar, be sure to ask event producers; "Is your event USASF Sanctioned?" All USASF member competition event producers who produce cheer competitions must meet the following minimum standards in order for their competitions, that include all star divisions, to be sanctioned. The USASF Sanctioning Compliance Committee will oversee all reported sanctioning noncompliance violations. A properly equipped EMT or athletic trainer present and ready to handle emergencies. $2,000,000 (Aggregate) in general liability insurance coverage. USASF membership rules, guidelines and policies must be followed. Only offer divisions, levels and categories from the approved USASF Age and Levels grid. Have at least one USASF Certified Safety Judge onsite at the competition. Event Producer will enforce USASF Safety Rules, Age Grid & Levels and safety violations. Team performances will not be scheduled to start earlier than 7:00 am and run no later than 11:00 pm. Have a documented plan that outlines how to handle emergency situations on site in competition venues and event management staff must review prior to producing an event. All music played at sanctioned events must comply with applicable copyright law. Provide at least one full 42' by 54' by1 3/8" carpet bonded foam matted practice area. Any space provided for building or tumbling skills must be carpet bonded foam. If performance or practice areas are outdoors, provide suitable foul weather alternatives. Provide a method of cleaning practice mats of bodily fluids. Backstage time between when a team finished warm ups and is on the competition floor should be no sooner than 8 minutes and no longer than 30 minutes. NOTE: Teams delayed to perform after 30 minutes should have the opportunity to warm up again or be given an area and posted list of exercises to rewarm up their muscles. Quick Toe Raises, Squat Jumps, Jumping Jacks, Bridges, Running with High Knees and or Punches. All official warm up mats should have a minimum clearance of 3' on all sides. NOTE: If an event producer has a decline border surrounding their performance surface, the length of the decline may be included in the mandated 3' clearance area. 7. If a full-size spring floor (42' by 54') is not provided as part of the warm-up rotation, a 12' by 60' tumbling surface must be provided that is of the same floor construction as the performance floor. Provide a 42' by 54' performance floor matted with a minimum 1 3/8" carpet bonded foam with panels joined by 4" tape. The performance floor will have a minimum clearance of 4' on the supporting surface before any obstruction. NOTE: If an event producer has a decline border surrounding their performance surface, the length of the decline may be included in the mandated 4' clearance area. An unobstructed ceiling height of 20' over the performance floor. If the performance floor is on a built stage, the stage must have a minimum 4' of additional supporting surface beyond the 54'X42' performance floor. 1. Any minimum standards that are not met in the Warm Up and or Performance Area must be disclosed to all competitors no later than at the point of registration (i.e prior to payment received). Event producers accepted for USASF membership after June 1, 2009 must be in business successfully conducting competitions for 3 years before they will be approved to hold USASF sanctioned competitions. Documentation and/or proof of holding legitimate and safe events may be requested by the USASF before approval. A competition will be sanctioned only if the management or executive staff of the event producer conducting the event has at least 3 years experience conducting competitions. USASF Member Event Producers with less than 3 years experience may communicate they are USASF members "following" the USASF Cheer Event Sanctioning Standards but will be under review by the USASF through the completion of the 3rd year of experience. They may only use the words "Provisionally Sanctioned Event" until their third year of conducting events is complete and the events they wish to have sanctioned meets all other sanctioning criteria. Required judges' meeting/orientation/training prior to start of competition. Have a separate safety and deduction judge per panel (it should not be the same person). When possible, there should be a separate difficulty and technique judge per category. 5 minute minimum (6 min recommended) to watch and score routines. Any score changes must be communicated to the judge. Follow the 'USASF Routine Interruption Due To Injury' protocol for all sanctioned events. Currently, this is a recommendation to all event producers. The protocol is to protect everyone's interest, with the focus on the injured athlete during an event. Scheduled meal and restroom breaks for judges. Access to water and/or refreshments while judging. All USASF member competition event producers who produce dance competitions must meet the following minimum standards in order for a competition, that includes all star dance divisions and categories, to be sanctioned. The USASF Dance Sanctioning Compliance Committee will oversee all reported sanctioning noncompliance violations. A properly equipped EMT or athletic trainer present and ready to handle medical emergencies. A minimum of $1,000,000 (Aggregate) in general liability insurance coverage. USASF dance rules, guidelines and policies must be followed and enforced. Only divisions and categories from the approved USASF Divisions and Categories Guidelines may be sanctioned by the USASF. Have at least one current season USASF Certified Dance Legality Official onsite at the Dance Worlds qualifying event. Team performance will not be scheduled earlier than 7:00am and perform no later than 11:00pm. Have a documented plan on site in competition venues that outlines how to handle emergency situations. Event management staff must review the plan prior to producing an event. By signing the annual USASF Company Member Agreement, event producers will affirm such a plan is in place. Make best efforts to follow the USASF Recommended Standards for Judges & Scoring at Sanctioned Events (below). Provide warm-up room space and time with a similar surface to the performance floor. Provide information regarding warm-up room surface at time of registration. If warm-up areas are outdoors, provide suitable foul weather alternatives. Provide a method of cleaning warm-up area surfaces of bodily fluids, dust and debris from prior performances. Offer Industry Recommended Performance Floor: A regulation floor that includes a minimum of a 42" X 42" Marley, Roscoe, Harlequin (or similar) floor over a floating wood floor or sport court. It may be laid from front to back (like Worlds) or side to side put together with gaffer's tape or equivalent. Marley and similar floors all range in strip/panel size. Teams should check with the Event Producer for specifics being offered at their events. The Dance Worlds performance floor surface will be a Marley floor. There will be a center line from the front of the floor to the back. Bare concrete, grass, and/or uneven surfaces are not allowed. An unobstructed ceiling height of 15 feet over the performance floor must be provided. If performance areas are outdoors, provide suitable foul weather alternatives. Provide a method of cleaning performance area surfaces of bodily fluids, dust and debris from prior performances. Any minimum standards that are not met in the Warm-Up and/or Performance Area must be disclosed to all competitors no later than at the point of registration (i.e. prior to payment received). Event producers accepted for USASF membership after June 1, 2009 must be in business successfully conducting competitions for 3 years before they will be approved to hold USASF sanctioned competitions. Documentation and/or proof of holding legitimate and safe events may be requested by the USASF before approval. A competition will be sanctioned only if the management or executive staff of the event producer conducting the event has at least three years experience conducting competitions. USASF Member Event Producers with less than 3 years experience may communicate they are USASF members "following" the USASF Dance Event Sanctioning Standards but will be under review by the USASF through the completion of the 3rd year of experience. They may only use the words "Provisionally Sanctioned Event" until their third year of conducting events is complete and the events they wish to have sanctioned meets all other sanctioning criteria. USASF Recommended Standards for Judges & Scoring at Sanctioned Events. All teams, athletes, coaches and personnel attending a USASF sanctioned event that are competing or performing as an Exhibition Team in an All Star Division must meet the eligibility requirements. Program membership paid for the current membership term. For multi-location programs, location membership must be paid for each location attending the event. Associate Rosters, through the Program's USASF profile, for all teams attending the event prior to the event start date (or earlier if required by the Event Producer). This applies to all athletes competing or performing for a US based All Star Cheer or Dance Program, including athletes on Novice, Prep Teams, and Show or Exhibition Teams (including Parent Teams). Athlete membership paid for the current membership term. 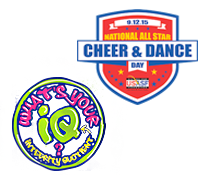 Exception: Exceptional Athletes performing or competing on CheerABILITES & DanceABILITIES teams receive a complimentary athlete membership to the USASF. Listed on the roster as an active or reserve athlete for the team(s) with which he/she will be entering the warm-up room and performing. This applies to all athletes 21 years of age or older competing or performing for a US based All Star Cheer or Dance Program, including athletes on Open or Exhibition Teams (including Parent Teams). Green Light Background Check Status issued by the National Center of Safety Initiatives* with an expiration date of 7/31/2019 or later. NOTE: This does NOT apply to Exceptional Athletes performing or competing on CheerABILITIES & DanceABILITIES teams . They receive a complimentary athlete membership to the USASF and are not required to have the background check. Program membership fee has been paid for the current membership term. Listed on the compliance roster as an owner for the Program. Coach membership fee has been paid for the current membership term. Listed on the roster as a coach for the team(s) with which he/she is entering the warm-up room. Auxiliary membership fee has been paid for the current membership term. Background checks must have been completed under or shared to the USASF account AND updated in the member Coach or Owner profile. Letters from NCSI to the Event Producer will not be accepted. Membership for Exceptional Athletes is complimentary. The program enters the athletes through the program profile. When a team is created within the program profile and designated as CheerABILITIES or DanceABILITIES and the athlete has been designated as Exceptional Athletes, the athletes can be added to this roster even though a membership fee has not been paid. NEW for the 2018-2019 Season, Exceptional Athletes need to have a birth certificate uploaded. Any team attending a USASF Sanctioned event that is associated with a USASF member program must be rostered. This applies to all exhibition team performances including Parent Teams. All Star Programs may not also have a Rec team that competes and/or performs at USASF Sanctioned events. Please complete the search filters below. Scroll down the page to view the search results.